I have extremely fond memories of playing through--or at least trying to play through--Treasure's Guardian Heroes back in the day. 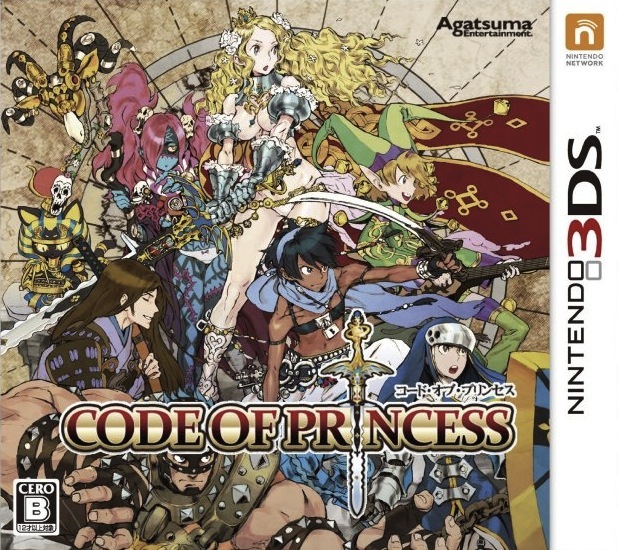 As such, I sat up and took notice of Agatsuma Entertainment's eerily similar 3DS-based brawler, Code of Princess, after reading that it was developed by some of the same folks who made the aforementioned Sega Saturn classic. Another piece of news that prompted me to sit up and take notice of this, er, "bosomy" beat 'em up: Atlus has decided to localize and release it in North America sometime this autumn. 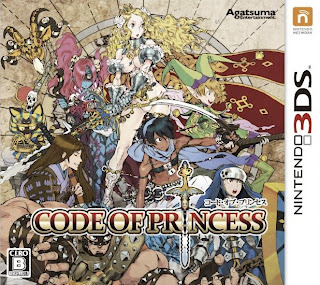 Will the art below actually grace the covers of North American copies of Code of Princess when they hit store shelves later this year? I kind of doubt it, but I'm going to suspend my feelings of disbelief for the time being so all of us can enjoy another round of "Which Box Art is Better?" As for which one I prefer: Well, I'm sure some of you (perhaps many of you) are going to disagree with me, but I like the Japanese cover more than its North American counterpart. Sure, the former is a bit crowded and cacophonous, but I like that it features a number of characters and quite a bit of color. I find the latter, on the other hand, to be just a bit too straightforward--especially for such a crazy title. How about you guys and gals? Does the more balanced North American art give you goosebumps, or does the jumbled, messy Japanese art make you jump for joy? They're actually both pretty good. I'm torn. Adam: Fair enough! I like both of them, too, honestly. Or at least I won't complain if the NA version looks as it does in this post. Justin: Yes, check it out. It's basically a brawler that allows you to jump into the scenery and then back into the foreground. Brawlers aren't usually my thing, but I loved how Guardian Heroes looked and felt, so if this is anything like that I'm sure I'll be happy with it. Definitely the Japanese one. Plonking text over the middle of the character is awful. I'd be lying if I said I was more preferable to the Japanese box for more details. Usually that can be annoying, but for this instance, I prefer it. Hayden: I agree about the plonking text over the middle of a character. I guess we'll see soon enough if the US box art is final or not. As for this game being like Guardian Heroes: Yep! Like I said early on in the post, Code of Princess supposedly is being made by some of the same folks who made Guardian Heroes. To which I say: YES! Motherplayer: So, usually you find "busy" box art to be annoying, but in this case you don't mind it? Works for me! Of course this is another game I'm going on about during the Gayme Bar podcast this week. It was almost my game of show until they announced Tokyo Jungle was coming here. As for you going on about this game on the new Gayme Bar podcast: OK, now I *really* have to listen to that one. Especially if it includes talk about Tokyo Jungle. Is Tokyo Jungle going to be a PSN-only release in the US? I would guess so. Oh, well, at least it's being released here. Also, maybe having it be PSN-only will make it a bit cheaper? Bryan - Of course I was the only one there who knew what Code of Princess was, but everybody's excited about Tokyo Jungle coming. According to this article it's a PSN game. So are you finally going to buy a PS3 now? Ah, so you were kind of the resident Nintendo expert during that particular podcast, eh? That's pretty much what I expected of Tokyo Jungle (that it would be a PSN game). Of course I'd prefer it to be a physical release, as I'd love to see the box art that they come up with for it, but I'll take what I can get. As for me getting a PS3: Well, that never was a question, really. The question at this point is: When? That I'm not sure of. I'm guessing it'll happen later this year, but the Wii U may screw things up a bit. Rest assured, though, that I'll get a PS3 eventually. I want far too many games for it at this point. As a new PS3 owner, I can assure you it's worth buying one just for 3D Dot Game Heroes. That game is so much fun! You didn't have a PS3 all along, warp? I'm surprised! What PS3 games do you have at the moment? Yeah I just got it last month, so I've been buying mostly the $15 games on Amazon. I've got FFXIII, Dark Souls, Mass Effect 3, Metal Gear Solid 4, Enchanted Arms, Devil May Cry 4, Resonance of Fate, Genji, Prince of Persia, Bayonetta, and El Shaddai. Ah! Dark Souls, how could I forget about that one? Demon's Souls, too. How are you liking Dark Souls, by the way? Gosh, the Japanese cover is downright cute! Sure, it shows more of the heroine's skin, but... there's so much cuteness! Cuteness and skin is the best combo. The NA cover is... I dunno. I have nothing to comment on it, it's just so unspecifically... there. Glad we're getting this game either way, of course! Hello Kamiwoo! I was just thinking about you. Really! Haven't seen you around here or around Twitter lately. Hope all is well with you? First of all, I have to say I was reading through the comments here to see which way everyone went, and I saw warp mention that Tokyo Jungle is coming out in English?! That has seriously made my day! Catching up on E3 news has been tough, and virtually no one cares about Tokyo Jungle, so I was really happy to read that. Now I don't have to import! Getting back on topic – I definitely prefer the Japanese version, even though it's cluttered. The colors, characters, and flatter "storybook" illustration style are all so much more appealing. Regardless, I'm so intrigued that Atlus decided to release this one. Anne: Yes, isn't it great news that Tokyo Jungle will be released outside of Japan? I really didn't think it would happen. Anyway, here's hoping it's not too much -- as in, $19.99 or less? Oh, hell, I'll probably buy it regardless -- assuming I have a PS3 by then, of course. 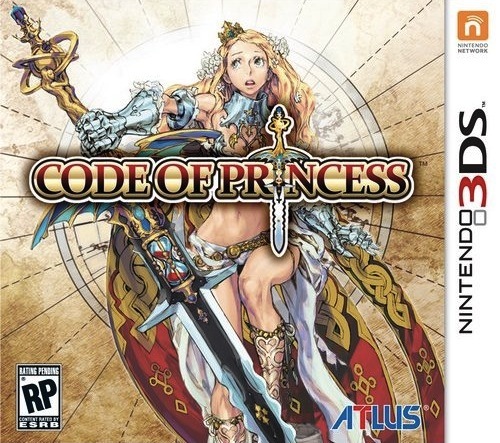 As for Code of Princess and its box art: I agree with you wholeheartedly. I also agree that Atlus' decision to release it in NA is intriguing. I thought it had a good chance of being brought out of Japan, but I thought Aksys or someone like that would be the one to do it. BTW, the podcast finally came out yesterday (in case you haven't noticed). Hopefully it lives up to my hype (I'm too scared to listen to it myself). warp: Dark Souls starts with a boss fight? Hoo, boy, that sounds interesting. You're not alone in preferring turn-based games, BTW. Oh, and thanks for letting me know about the podcast. I'll check it out this weekend! Bryan! I've been well, thanks! I'm still on Twitter as usual, but I had a computer upgrade recently and it's always so hard to get organized with bookmarks and such... don't worry, I still follow this blog religiously! Oh, that's good to hear you're well, Kamiwoo! As for us never being satisfied with NA covers: You're probably right. That said, I'm more satisfied with them than I used to be. Game pubs have come a long way in the last 10-20 years! In the first one she is saying "You covered my boooooooooooobs! awwwwwwwwwwwwwwwwwwwww!!!" In the japanese cover "Look at my boooooooobs!" LOL sorry couldn't help myself. I think she takes the cake for the most ridiculous cleavage in a computer game character. But really, I think either look fine. First one tho is obviously to make it look "tame". As for the character having the most ridiculous cleavage in gaming: I'm not sure I can agree, but I do agree that she has some fairly ridiculous cleavage. And, yes, both box art examples look OK to me. The Japanese one just looks a bit better! My mistake! I meant to say I prefer the Japanese art in general for this.